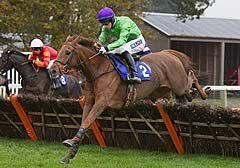 Eighth over the National fences last time out, trainer Warren Greatrex had stated that his intention was to get him qualified for the big race by getting him placed over three miles. His seven-year-old did better than that, though, and was always travelling well in the hands of Dougie Costello. A brace of greys took the field along with Corrin Wood frequently outjumping Rose Of The Moon, as Donald McCain's runner showed far more zest than on his seasonal return. Still in front three out, top-weight Corrin Wood was just beginning to tire as Dolatulo shot up the rails to hit the front. Cape Tribulation, winner of the race two years ago, gave chase but it was to prove in vain as the 14-1 winner had two and a quarter lengths in hand at the line, with Corrin Wood staying on for third. Saturday's Haydock winner Broadway Buffalo attempted the waiting tactics again but a bad blunder on the second circuit hampered his chances. Greatrex said: "It was a great performance. I thought he had a squeak, but I didn't expect him to win like that. "Long-term I think he could be a Grand National horse. 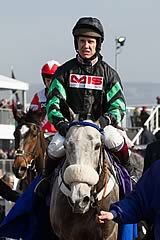 He seems to be improving, he stays well and he's jumped around the National fences before. "He's just rising eight, but he's run plenty over fences and, touching wood, he's a good, accurate jumper. "We'll see what the handicapper does, but I'm guessing he's going to be rated in the 140s after today. 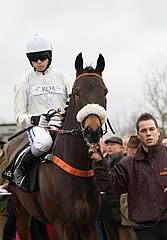 The sensible thing to do might be to run him over hurdles before going to Aintree, but we'll see."